It all began with my grandfather. 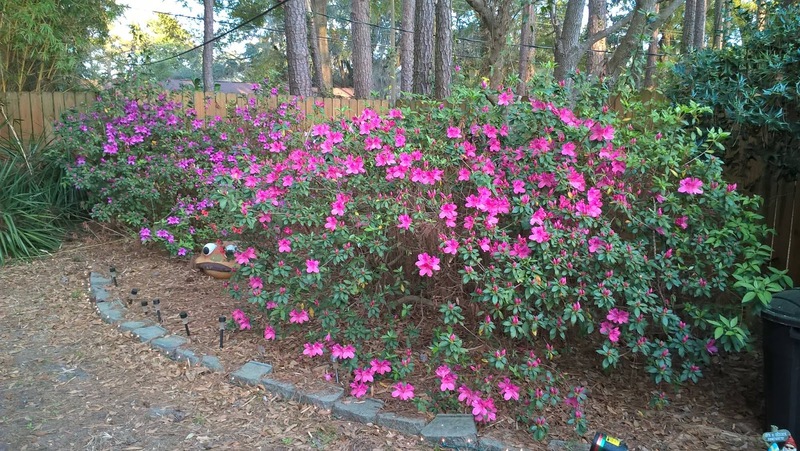 Pop planted those azalea bushes all over the property and when you’d drive up through the driveway, you were surrounded in an explosion of reds, whites, and my favorite, the pink azalea. I always associated azaleas with my grandfather and Easter because this would be about the time we’d rive down from the mountains to visit. On my first date with Kim, we went out to Bonaventure and the azaleas were literally popping with color. We drove around talking and getting to know each other. It was the second time we were speaking face to face but because I was by the Salt River and all the azaleas, I felt right at home. It was a date I never wanted to end and so far it’s still going. There are several white and pink bushes over at my school where I teach and I daily making my trek across campus and purposely walk outside so I can be surrounded by them. Azaleas and live oaks are not something most teachers can boast about on their campus and I consider myself quite lucky. When were house shopping, I knew I wanted certain things in my yard. I had to have live oaks, palm trees and a few cedars. When I walked into the backyard of what would shortly become the Manor, I knew I hit the jackpot especially when I saw an entire side of the yard was just holly bushes and azaleas. I spend much of my time at home staring out my bedroom window into the backyard. It’s not very big but it has a taste of everything I believe represents what Savannah is to me. If you drop by Stately Rich Manor, you’ll probably find me on the back porch with radio playing and just relaxing while I survey my surroundings. I’m a lucky man.